How Do I Use the One-Click WordPress Staging Environment? 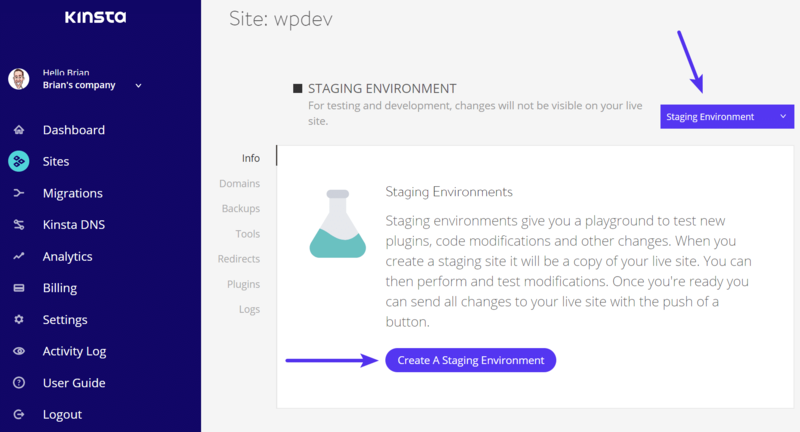 Each WordPress install at Kinsta can have its own staging environment which is completely separate from your live production site. This is great for testing new WordPress versions, plugins, code, and general development work. Create a dev site in a matter of minutes and share it with your team. Creating a staging site is incredibly simple. Just click on “Sites” in the left navigation. You’ll see a list of your sites/installs. Click on the one you’d like to add a staging area to. Click on “Staging” from the drop-down menu at the top right, then click on the “Create a Staging Environment” button. The URL structure for every staging area appears as follows: https://staging-sitename.kinsta.cloud. If you have SSL enabled on your live site, SSL will also be enabled on your staging site. Our old format was https://staging-sitename.kinsta.com. If you have an older staging site, it might still be using this format. Please wait 10-15 minutes until the staging is created and DNS propagates. 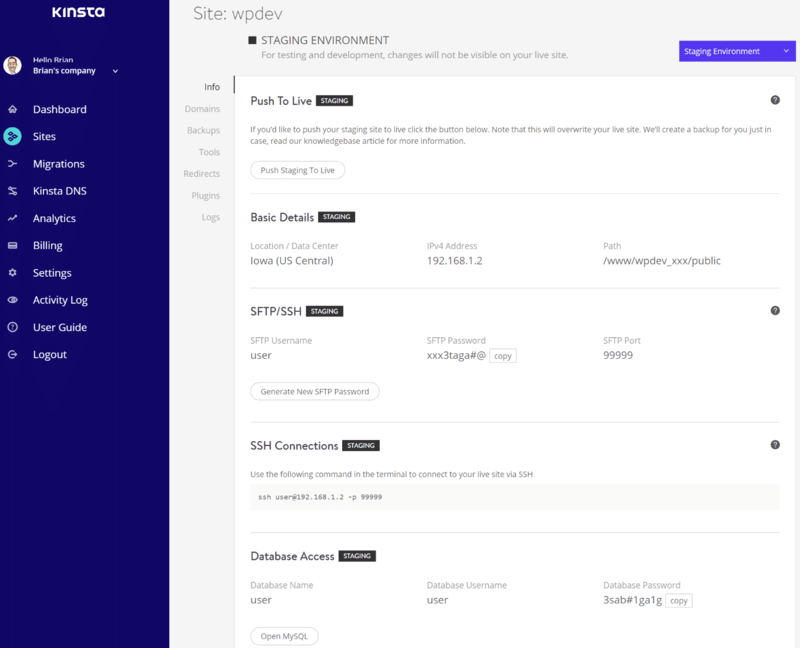 You will then have a separate control panel with your connection information, DNS, backups, tools, and plugins for your staging environment. You can launch phpMyAdmin from right within the dashboard. The URL structure for phpMyAdmin staging will appear as follows: https://mysqleditor-staging-sitename.kinsta.cloud. You can then easily remove your staging site by clicking “Delete Staging Environment” from the dashboard. When deleting a staging site all of its data will be completely removed, including the databases and files. 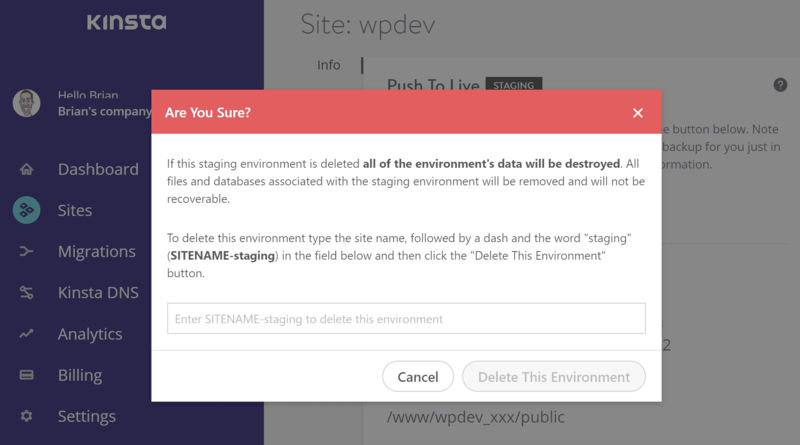 To delete this environment type the site name, followed by a dash and the word “staging” (SITENAME-staging) in the field below and then click the “Delete This Environment” button. To refresh your staging environment, simply delete it and create a new one. This will then contain the most recent version of your production database and files for testing. Or you can restore a backup from your production site to staging. If you would like to push your staging site to live you can utilize the push staging to live feature. You can also easily restore your WordPress site from a backup and push it directly to your staging environment. Check out how to restore a WordPress backup to staging. If for some reason your staging environment is stopped you might see the following error: 501 not implemented. When you use the staging environment there are a couple important things to be aware of. Due to the fact that staging environments are for development purposes, debugging, and testing, caching is disabled. If you try to run website speed tests you will see higher than average load times due to the fact that the pages aren’t being served from cache. Because the staging environment is simply a copy of your production site, your WordPress admin login credentials will be the same for both your live site and staging site. Unless you change them after the fact. Kinsta temporary URLs also have a robot-restricting robots.txt, meaning the staging-sitename.kinsta.com URL’s won’t be indexed by the search engines. If you use social scheduling plugins such as CoSchedule or Social Networks Auto Poster, it is recommended that you deactivate these plugins on your staging site. Otherwise, they might start sharing to social networks using your staging URL: https://staging-sitename.kinsta.cloud. This could then skew your analytics. 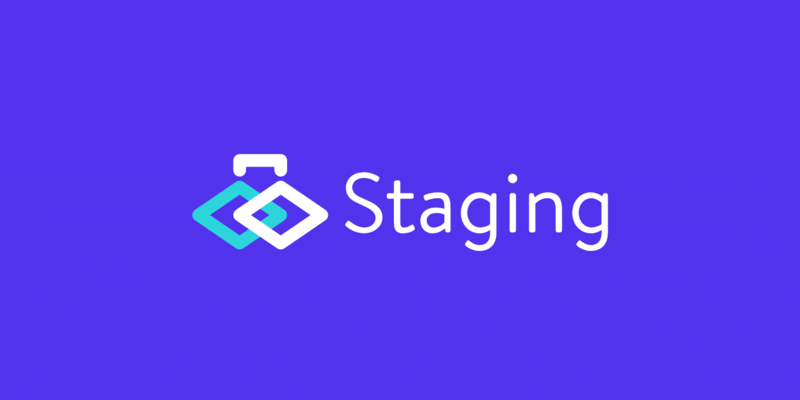 The Jetpack plugin will automatically run in staging mode on Kinsta staging environments. You will see a message: “You are running Jetpack on a staging server.” While in Staging Mode, your staging site will act like your production site in virtually all ways except no data is passed up to WordPress.com and you cannot disconnect the staging site (to prevent an issue that would lead to problems with your production site). Depending on how your multisite is set up, it may or may not work with our staging environment. If it’s a subdirectory multisite (example.com, example.com/subsite1, example.com/subsite2) it will work fine with our staging environment. If it’s a subdomain multisite (example.com, subsite1.example.com, subsite2.example.com) it will work fine provided the subsites don’t require HTTPS. If the subsites do require HTTPS, you will have to bypass SSL errors on staging to access the subsites. This doesn’t impact functionality in any way. If it’s a domain-mapped multisite (loads different subsites at completely different domains, i.e, example.com, example1.com , example2.com) it won’t work without significant manual setup. Option 1: Turn off domain mapping and go back to the standard subdirectory/subdomain setup. Do a search and replace in the database manually. Option 2: Set up staging subdomains for each live domain, add all those to the staging site, and run a search and replace in the database manually.